DIE Veneris, videlicet, 5 die Augusti. Colonel Read's Petition forthe Liberty of The Tower. L. Newnham and E. of Bollingbroke versus Pagett. L. Balmerino and Judge Heath. Message from the H. C. for the E. of Peterborough to be L. Lieutenant of Northamptonshire, in the room of L. Spencer. L. Spencer's Deputations to Deputy Lieutenants to remain in Force till superseded. The Speaker to acquaint the E. of Peterborough with hese Votes. Message from the H. C. for a Conference about Intelligence from Somersetshire. To return Thanks to Lady Rumney, for a Benevolence for the Public Service. L. C. J. commanded by the King to attend Him. Ordered to attend the House. Message from the H. C. for the Lords Concurrence in the following Orders, &c.
Justice Crawley Leave to be absent. L. Mayor, &c. to attend. Conference about Intelligence from Somersetshire reported. Votes of the H. C. thereupon. Marquis of Hertford, L. Pawlett, and L. Trowbridge, sentsor, as Delinquents. These Votes, and L. Hertford's Letter to the Queen, to be printed. Message from the H. C. about a Letter from Sir Richard Onslow, concerning apprehending Justice Mallett. Sheriff of Surrey to assist in apprehencing him. Warrant from the King, for him to attend Him. Letter to the E. of Peterborough. Marquis of Hertford's Letter to the Queen. Intelligence from Holland, about Supplies raising there for the King. Intelligence from Somersetshire, of some Transactions there. 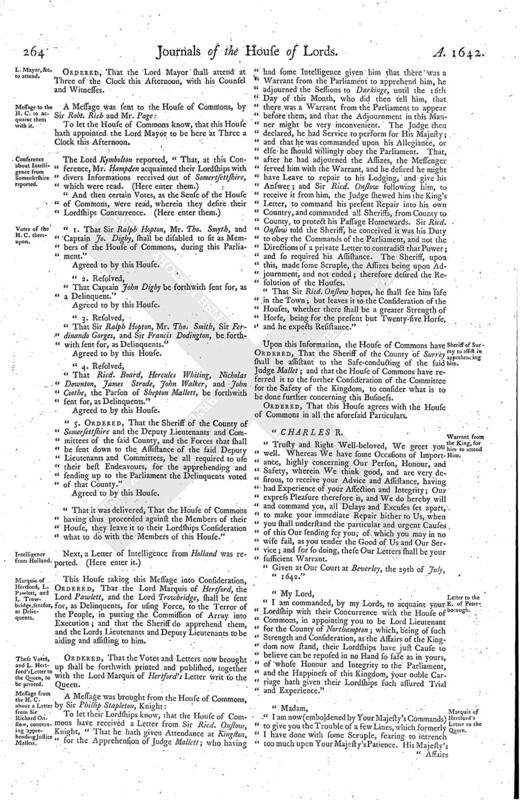 Ordinance to prevent the Execution of the Commission of Array in Norwich. Indemnity for the Mayor, &c. of Norwich, for seizing Tresewell, who would have put the Commission of Array in Execution. Instructions for the Deputy Lieutenants of Norwich. Order to release Persons imprisoned for opposing the Commissions of Array. Message from the H. C. with an Order about Worcestershire. Lord Mayor at the Bar; his Defence concluded. H. C. to reply To-morrow. Justice Crawley's Certificate, concerning the Cause between Despaigne and De Champes. Indemnity for Worcestershire, for opposing the Commission of Array. The Petition of Ric. Brewton was read; shewing, That this House having, upon hearing of the Cause, Ordered the Transcript of the Record to be returned into the King's Bench, to take out Execution against Sir Jo. Lenthall, but is deprived of his Benefit of their Lordships Order, by reason that Sir Jo. Lenthall since hath procured himself to be sworn of the Privy Chamber to His Majesty, and made over his Estate in Trust, purposely to defeat the Petitioner of his Remedy in Law." Ordered, That the said Ric. Brewton shall receive the Benefit of the Law, according to the virtue of his Execution, notwithstanding any Pretence of Privilege whatsoever. A Petition of Colonel Reade, Prisoner in The Tower, was read; desiring he might enjoy the Liberty of The Tower, as other Prisoners have. Next, a Letter was read, which he sent to his Wife into Ireland. Ordered, That the said Wm. Pagett shall appear before this House on Tuesday come Fortnight; and the Consideration of the Petition is referred unto the Committee for Petitions. Ordered, That the Cause of the Lord Balmerino, against Judge Heath, is put off until the Third of October next. A Message was brought from the House of Commons, by Mr. Marten; who brought up certain Votes concerning North'tonshire, to which the House of Commons desires their Lordships Concurrence, with what Expedition their Lordships can. "That this House doth nominate and approve the Earl of Peterborough to be Lieutenant of the County of North'ton, in the Place of the Lord Spencer, formerly nominated Lieutenant of that County." Ordered, That this House agrees with the House of Commons in this Vote. To let them know, that their Lordships are ready to proceed in the Cause against the Lord Mayor. Ordered, That the Gentlemen of North'tonshire, formerly appointed for Deputy Lieutenants, Colonels, Captains, and other Officers, by the Lord Spencer, may be authorized by both Houses to do and execute all Things which they might have done by virtue of their several Commissions, as if they were still in Force, until the Earl of Peterborough shall have granted his Deputations, with the Allowance of both Houses. Ordered, That the Speaker of this House do write a Letter to the Earl of Peterborough, to acquaint his Lordship with the Votes of both Houses; and the Lord Willoughby of Parham and the Lord Feilding were appointed to make a Draught of such a Letter. And the Lord Feilding reported the Draught of the said Letter; which being read, in hæc verba, was approved of; and the Speaker was to sign it, and send it away. That they have received some Intelligence of a very high Nature, from Somersettshire and other Parts, which they desire to communicate to their Lordships, at a Conference. Agreed, To give a Conference presently. 2. To let their Lordships know, that the Lady Rumny hath given a very large Gift (Two Thousand Pounds) for the Defence of the King and Parliament, for which the House of Commons have appointed some Members (fn. 2) of their House to go and give her Thanks; and the House of Commons refers to their Lordships, whether they will think fit to send any Members of this House with the House of Commons. Ordered, That the Earl of Stanford shall go, with the Members of the House of Commons, to give the Lady Rumny Thanks. The Answer was returned as abovesaid. It was signified to this House, "That the Lord Chief Justice hath received a Letter of Command from the King, to come and attend Him at Yorke." The House commanded, and Ordered, the Lord Chief Justice to stay and give his Attendance upon this House, according to his Writ. 2. A Declaration of Indemnity to the Mayor and Sheriffs of Norwich, for apprehending a Drummer, &c. which being read, it was agreed to by this House. Agreed to by this House. 5. An Order, That the Lord Lieutenant of Warwicke shall suppress the Commission of Array, and maintain the Ordinance for the Militia. To be considered of, and made more particular. That this House agrees to the Instructions and Orders concerning the City of Norwich, and the Order concerning the Persons in Lancashire; but for the Order concerning Warwickshire, this House will send an Answer, by Messengers of their own. The House of Commons being come to the Conference, this House was adjourned during Pleasure; and the Lords went to the Conference; which being ended, the House was resumed. Ordered, That Justice Crawley hath Leave to go into the Country, for a Week. Ordered, That the Lord Mayor shall attend at Three of the Clock this Afternoon, with his Counsel and Witnesses. To let the House of Commons know, that this House hath appointed the Lord Mayor to be here at Three a Clock this Afternoon. "1. That Sir Ralph Hopton, Mr. Tho. Smyth, and Captain Jo. Digby, shall be disabled to sit as Members of the House of Commons, during this Parliament." "That Captain John Digby be forthwith sent for, as a Delinquent." "That Sir Ralph Hopton, Mr. Tho. Smith, Sir Ferdinando Gorges, and Sir Francis Dodington, be forthwith sent for, as Delinquents." "That Ricd. Board, Hercules Whiting, Nicholas Downton, James Strode, John Walker, and John Coothe, the Parson of Shepton Mallett, be forthwith sent for, as Delinquents." "5. Ordered, That the Sheriff of the County of Somersettshire and the Deputy Lieutenants and Committees of the said County, and the Forces that shall be sent down to the Assistance of the said Deputy Lieutenants and Committees, be all required to use their best Endeavours, for the apprehending and sending up to the Parliament the Delinquents voted of that County." "That it was delivered, That the House of Commons having thus proceeded against the Members of their House, they leave it to their Lordships Consideration what to do with the Members of this House." This House taking this Message into Consideration, Ordered, That the Lord Marquis of Hertford, the Lord Pawlett, and the Lord Trowbridge, shall be sent for, as Delinquents, for using Force, to the Terror of the People, in putting the Commission of Array into Execution; and that the Sheriff do apprehend them, and the Lords Lieutenants and Deputy Lieutenants to be aiding and assisting to him. Ordered, That the Votes and Letters now brought up shall be forthwith printed and published, together with the Lord Marquis of Hertford's Letter writ to the Queen. To let their Lordships know, that the House of Commons have received a Letter from Sir Ricd. Onslow, Knight, "That he hath given Attendance at Kingston, for the Apprehension of Judge Mallett; who having had some Intelligence given him that there was a Warrant from the Parliament to apprehend him, he adjourned the Sessions to Darkinge, until the 16th Day of this Month, who did then tell him, that there was a Warrant from the Parliament to appear before them, and that the Adjournment in this Manner might be very inconvenient. The Judge then declared, he had Service to perform for His Majesty; and that he was commanded upon his Allegiance, or else he should willingly obey the Parliament. That, after he had adjourned the Assizes, the Messenger served him with the Warrant, and he desired he might have Leave to repair to his Lodging, and give his Answer; and Sir Ricd. Onslow following him, to receive it from him, the Judge shewed him the King's Letter, to command his present Repair into his own Country, and commanded all Sheriffs, from County to Country, to protect his Passage Homewards. Sir Ricd. Onslow told the Sheriff, he conceived it was his Duty to obey the Commands of the Parliament, and not the Directions of a private Letter to contradict that Power; and so required his Assistance. The Sheriff, upon this, made some Scruple, the Assizes being upon Adjournment, and not ended; therefore desired the Resolution of the Houses. "That Sir Ricd. Onslow hopes, he shall see him safe in the Town; but leaves it to the Consideration of the Houses, whether there shall be a greater Strength of Horse, being for the present but Twenty-five Horse, and he expects Resistance." 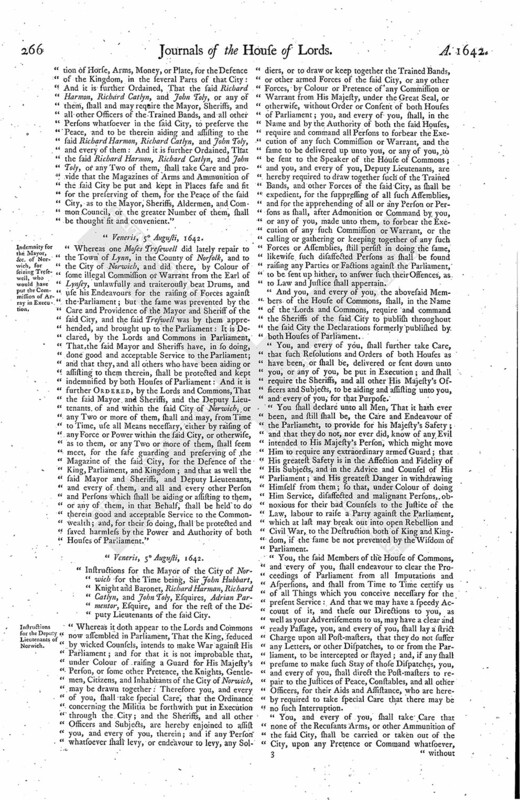 Upon this Information, the House of Commons have Ordered, That the Sheriff of the County of Surrey shall be assistant to the Safe-conducting of the said Judge Mallet; and that the House of Commons have referred it to the further Consideration of the Committee for the Safety of the Kingdom, to consider what is to be done further concerning this Business. Ordered, That this House agrees with the House of Commons in all the aforesaid Particulars. "Trusty and Right Well-beloved, We greet you well. Whereas We have some Occasions of Importance, highly concerning Our Person, Honour, and Safety, wherein We think good, and are very desirous, to receive your Advice and Assistance, having had Experience of your Affection and Integrity; Our express Pleasure therefore is, and We do hereby will and command you, all Delays and Excuses set apart, to make your immediate Repair hither to Us, when you shall understand the particular and urgent Causes of this Our sending for you; of which you may in no wise fail, as you tender the Good of Us and Our Service; and for so doing, these Our Letters shall be your sufficient Warrant. Given at Our Court at Beverley, the 29th of July, 1642." "I am commanded, by my Lords, to acquaint your Lordship with their Concurrence with the House of Commons, in appointing you to be Lord Lieutenant for the County of Northampton; which, being of such Strength and Consideration, as the Affairs of the Kingdom now stand, their Lordships have just Cause to believe can be reposed in no Hand so safe as in yours, of whose Honour and Integrity to the Parliament, and the Happiness of this Kingdom, your noble Carriage hath given their Lordships such assured Trial and Experience." "I am now (emboldened by Your Majesty's Commands) to give you the Trouble of a few Lines, which formerly I have done with some Scruple, fearing to intrench too much upon Your Majesty's Patience. His Majesty's Affairs are now, I hope, in a prosperous Way; and the Affections of His People breaks out every Day more and more, who begin to have their Eyes open, and will, I believe, no longer be deluded with the imaginary Fears and Jealousies. "The King takes His Journey To-morrow towards Lyncolnshire, invited thereunto by a great Number of the best Gentlemen of that County. The Prince goes with Him. But His Majesty hath commanded me to return to Yorke, with the Duke of York, where he is to remain, until the King comes back, under the Charge of the Lord of Dorsett, because, by His Majesty's Commands, I am with all Speed to repair unto the West, to put his Commissions of Array in Execution, which I make no Doubt to perform without any great Difficulty. If God prospers us, as I trust He will in so good a Cause, we shall then shortly (I hope) be blessed and cheared up with Your Majesty's long-wished-for Presence; and hay then! down go they! and, to our greater Encouragement, Sampson is come over to us. Bey'ley, the 11th of July, 1642.
. . . . . . . . . . . . . Merchant, living at Roterdam, saith, "That he came from The Briell, in Holland, upon Monday last; and that, when he was there, he saw Two Captains, videlicet, Captain Padgett (as they told him his Name to be) and Captain Gerrard, who were newly come thither from The Haghe, and were discharged (as this Informant was there told) by the Prince of Orenge, to the End they might repair into the North of England, to serve the King; and saith, That there were divers other Lieutenants and Officers there, that were also forthwith to come into England for the same Purpose (as this Informant was there told), and should have come over with this Informant in the same Ship, but that it was to come to London. "This Informant heard also, That Mr. Germyn went from The Haghe, to The States Leaguer, near unto Rhineberck, towards Cullen, in the Queen's Coach, to the Prince of Orenge (by whom he was royally entertained), with the Queen's Letters to him, which contained the Names of such Officers as She had pricked, and desired the Prince of Orenge to discharge them, that they might come into England to serve the King. This Informant heard there also, That the Papists in Holland and Friz-land had lent the King Two Hundred Thousand Pounds; and he saith also, That he saw at The Briell Two Vessels, videlicet, a Pink and a Boyer, laden with Powder, Muskets, and other Ammunition, the one whereof went for Scarborough, and the other pretended to go for Ireland; and that Mr. Knolles (a Servant of the King's) went in that Boyer. "Also this Informant knoweth, that Mr. Jermyn came to hire a Coal Ship of Scarborough, being at Roterdam, and of about One Hundred and Fifty Tuns, to carry over certain Ammunition into the North of England; and the Master of the Ship told this Informant, That, when the Bargain was made with him by Mr. Jermyn, for the Hire of that Ship, Mr. Jermyn told him it was to carry over Letters into England; but, when the Master understood that it was hired to carry over Ammunition, he would not stand to his Bargain. He saith further, That, upon Monday was Sevennight, News was brought from Flushing to Roterdam, that The States Admiral had taken Nine English Ships, which were going into Dunkerke, and sent them to Flushing, because he found they carried Cordage and Ammunition; and that they said, they had One of the King's Ships to convoy them. He saith also, That he heard it credibly reported there, that young Mr. Griffith, having been at Paris to seek Mr. Jermyn, and not finding him there, came to him to The Haghe, where Mr. Griffith challenged Mr. Jermyn into the Field, and Mr. Jermyn took O'Neale to be his Second, and Mr. Griffith had a Scottish Man for his; and a Frenchman parted them. ". . . . . . . . . . . . ."
He saith also, "That Prince Robt. is at Helvore-sluce, ready to come over with the First Wind in The ViceAdmiral of Holland; the Ship came from The Briell on Monday last, to go to Helvore-sluce, to take him in." "The Message of the Members of the House of Commons, and the Deputy Lieutenants, the Committee of both Houses of Parliament for the Preservation of the Peace of the County of Som'stt, sent to Troopers, and divers Men in Arms gathered in Bodies in the Fields, about Shepton-Mallett, by Mr. Bull and Mr. Long, requiring them to demand of those Troopers and armed Men the Intention of their coming; and, if it were for Peace, then that they should return Home to their Houses; if not, that then they would take it as an Insurrection, and endeavour to repress it. "My Lord Marquis, being informed of a great Assembly to meet at Shepton in Arms this Day, and not knowing any Cause of such Meeting, sent me, and some other Justices of the Peace, in order to the Peace of this County, to know the Cause of such Meeting, and to prevent the Disturbance of the Peace. "I understand there is a great Assembly of armed Men now at Shepton, which I conceive is unlawful, and desire to know by what Authority they are met; for that, as yet, it seems to me a great Violation of the Peace of this County and the Kingdom, to appear so armed, and to receive their Answer. "After we understood that my Lord Marquis of Hertforde came into this County with Companies of armed Men, to put in Execution the Commission of Array, which is illegal, and settling himself at Wells, whither resorted many Men in Arms, both Horse and Foot; we, to preserve the Peace of this County, came this Day to Shepton Mallett." 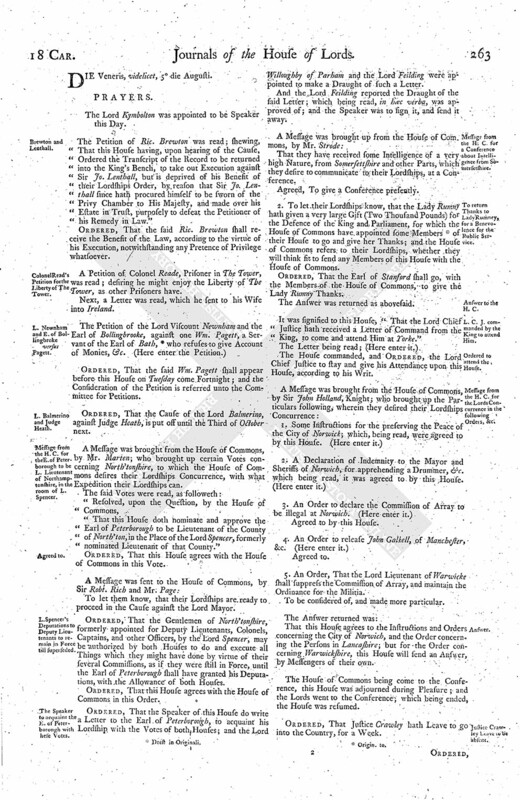 "It is Ordained, by the Lords and Commons assembled in Parliament, That Richard Harmon, Richard Catlyn, and John Toly, Esquires, or any of them, do forthwith repair unto the City of Norwich, and possess that City with the Declaration of both Houses, concerning the Illegality of the Commission of Array; and they, together with such others of the said City as they shall think fit to use and employ therein, do propound the Propositions concerning the Contribution of Horse, Arms, Money, or Plate, for the Defence of the Kingdom, in the several Parts of that City: And it is further Ordained, That the said Richard Harmon, Richard Catlyn, and John Toly, or any of them, shall and may require the Mayor, Sheriffs, and all other Officers of the Trained Bands, and all other Persons whatsoever in the said City, to preserve the Peace, and to be therein aiding and assisting to the said Richard Harmon, Richard Catlyn, and John Toly, and every of them: And it is further Ordained, That the said Richard Harmon, Richard Catlyn, and John Toly, or any Two of them, shall take Care and provide that the Magazines of Arms and Ammunition of the said City be put and kept in Places safe and fit for the preserving of them, for the Peace of the said City, as to the Mayor, Sheriffs, Aldermen, and Common Council, or the greater Number of them, shall be thought fit and convenient." "Whereas one Moses Tresewell did lately repair to the Town of Lynn, in the County of Norfolk, and to the City of Norwich, and did there, by Colour of some illegal Commission or Warrant from the Earl of Lynsey, unlawfully and traiterously beat Drums, and use his Endeavours for the raising of Forces against the Parliament; but the same was prevented by the Care and Providence of the Mayor and Sheriff of the said City, and the said Treswell was by them apprehended, and brought up to the Parliament: It is Declared, by the Lords and Commons in Parliament, That the said Mayor and Sheriffs have, in so doing, done good and acceptable Service to the Parliament; and that they, and all others who have been aiding or assisting to them therein, shall be protected and kept indemnisied by both Houses of Parliament: And it is further Ordered, by the Lords and Commons, That the said Mayor and Sheriffs, and the Deputy Lieutenants of and within the said City of Norwich, or any Two or more of them, shall and may, from Time to Time, use all Means necessary, either by raising of any Force or Power within the said City, or otherwise, as to them, or any Two or more of them, shall seem meet, for the safe guarding and preserving of the Magazine of the said City, for the Defence of the King, Parliament, and Kingdom; and that as well the said Mayor and Sheriffs, and Deputy Lieutenants, and every of them, and all and every other Person and Persons which shall be aiding or assisting to them, or any of them, in that Behalf, shall be held to do therein good and acceptable Service to the Commonwealth; and, for their so doing, shall be protected and saved harmless by the Power and Authority of both Houses of Parliament." "Instructions for the Mayor of the City of Norwich for the Time being, Sir John Hubbart, Knight and Baronet, Richard Harman, Richard Catlyn, and John Toly, Esquires, Adrian Parmentor, Esquire, and for the rest of the Deputy Lieutenants of the said City. 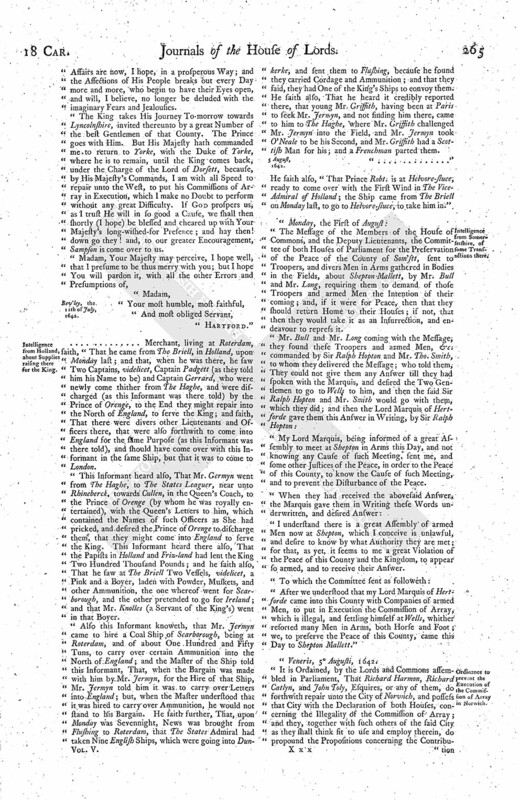 "Whereas it doth appear to the Lords and Commons now assembled in Parliament, That the King, seduced by wicked Counsels, intends to make War against His Parliament; and for that it is not improbable that, under Colour of raising a Guard for His Majesty's Person, or some other Pretence, the Knights, Gentlemen, Citizens, and Inhabitants of the City of Norwich, may be drawn together: Therefore you, and every of you, shall take special Care, that the Ordinance concerning the Militia be forthwith put in Execution through the City; and the Sheriffs, and all other Officers and Subjects, are hereby enjoined to assist you, and every of you, therein; and if any Person whatsoever shall levy, or endeavour to levy, any Soldiers, or to draw or keep together the Trained Bands, or other armed Forces of the said City, or any other Forces, by Colour or Pretence of any Commission or Warrant from His Majesty, under the Great Seal, or otherwise, without Order or Consent of both Houses of Parliament; you, and every of you, shall, in the Name and by the Authority of both the said Houses, require and command all Persons to forbear the Execution of any such Commission or Warrant, and the same to be delivered up unto you, or any of you, to be sent to the Speaker of the House of Commons; and you, and every of you, Deputy Lieutenants, are hereby required to draw together such of the Trained Bands, and other Forces of the said City, as shall be expedient, for the suppressing of all such Assemblies, and for the apprehending of all or any Person or Persons as shall, after Admonition or Command by you, or any of you, made unto them, to forbear the Execution of any such Commission or Warrant, or the calling or gathering or keeping together of any such Forces or Assemblies, still persist in doing the same, likewise such disaffected Persons as shall be found raising any Parties or Factions against the Parliament, to be sent up hither, to answer such their Offences, as to Law and Justice shall appertain. "And you, and every of you, the abovesaid Members of the House of Commons, shall, in the Name of the Lords and Commons, require and command the Sheriffs of the said City to publish throughout the said City the Declarations formerly published by both Houses of Parliament. "You, and every of you, shall further take Care, that such Resolutions and Orders of both Houses as have been, or shall be, delivered or sent down unto you, or any of you, be put in Execution; and shall require the Sheriffs, and all other His Majesty's Officers and Subjects, to be aiding and assisting unto you, and every of you, for that Purpose. 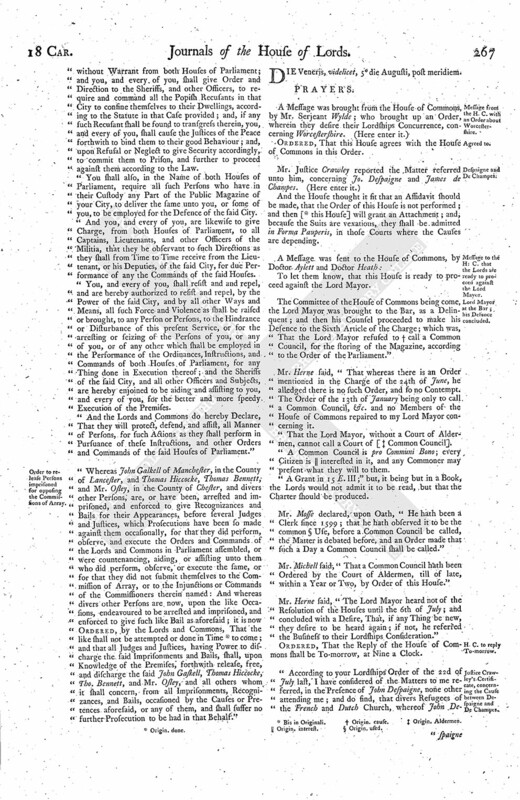 "You shall declare unto all Men, That it hath ever been, and still shall be, the Care and Endeavour of the Parliament, to provide for his Majesty's Safety; and that they do not, nor ever did, know of any Evil intended to His Majesty's Person, which might move Him to require any extraordinary armed Guard; that His greatest Safety is in the Affection and Fidelity of His Subjects, and in the Advice and Counsel of His Parliament; and His greatest Danger in withdrawing Himself from them; so that, under Colour of doing Him Service, disaffected and malignant Persons, obnoxious for their bad Counsels to the Justice of the Law, labour to raise a Party against the Parliament, which at last may break out into open Rebellion and Civil War, to the Destruction both of King and Kingdom, if the same be not prevented by the Wisdom of Parliament. "You, the said Members of the House of Commons, and every of you, shall endeavour to clear the Proceedings of Parliament from all Imputations and Aspersions, and shall from Time to Time certify us of all Things which you conceive necessary for the present Service: And that we may have a speedy Account of it, and these our Directions to you, as well as your Advertisements to us, may have a clear and ready Passage, you, and every of you, shall lay a strict Charge upon all Post-masters, that they do not suffer any Letters, or other Dispatches, to or from the Parliament, to be intercepted or stayed; and, if any shall presume to make such Stay of those Dispatches, you, and every of you, shall direct the Post-masters to repair to the Justices of Peace, Constables, and all other Officers, for their Aids and Assistance, who are hereby required to take special Care that there may be no such Interruption. "You, and every of you, shall take Care that none of the Recusants Arms, or other Ammunition of the said City, shall be carried or taken out of the City, upon any Pretence or Command whatsoever, without Warrant from both Houses of Parliament; and you, and every of you, shall give Order and Direction to the Sheriffs, and other Officers, to require and command all the Popish Recusants in that City to confine themselves to their Dwellings, according to the Statute in that Case provided; and, if any such Recusant shall be found to transgress therein, you, and every of you, shall cause the Justices of the Peace forthwith to bind them to their good Behaviour; and, upon Refusal or Neglect to give Security accordingly, to commit them to Prison, and further to proceed against them according to the Law. "You shall also, in the Name of both Houses of Parliament, require all such Persons who have in their Custody any Part of the Public Magazine of your City, to deliver the same unto you, or some of you, to be employed for the Defence of the said City. "And you, and every of you, are likewise to give Charge, from both Houses of Parliament, to all Captains, Lieutenants, and other Officers of the Militia, that they be observant to such Directions as they shall from Time to Time receive from the Lieutenant, or his Deputies, of the said City, for due Performance of any the Commands of the said Houses. "You, and every of you, shall resist and and repel, and are hereby authorized to resist and repel, by the Power of the said City, and by all other Ways and Means, all such Force and Violence as shall be raised or brought, to any Person or Persons, to the Hindrance or Disturbance of this present Service, or for the arresting or seizing of the Persons of you, or any of you, or of any other which shall be employed in the Performance of the Ordinances, Instructions, and Commands of both Houses of Parliament, for any Thing done in Execution thereof; and the Sheriffs of the said City, and all other Officers and Subjects, are hereby enjoined to be aiding and assisting to you, and every of you, for the better and more speedy Execution of the Premises. "And the Lords and Commons do hereby Declare, That they will protect, defend, and assist, all Manner of Persons, for such Actions as they shall perform in Pursuance of these Instructions, and other Orders and Commands of the said Houses of Parliament." 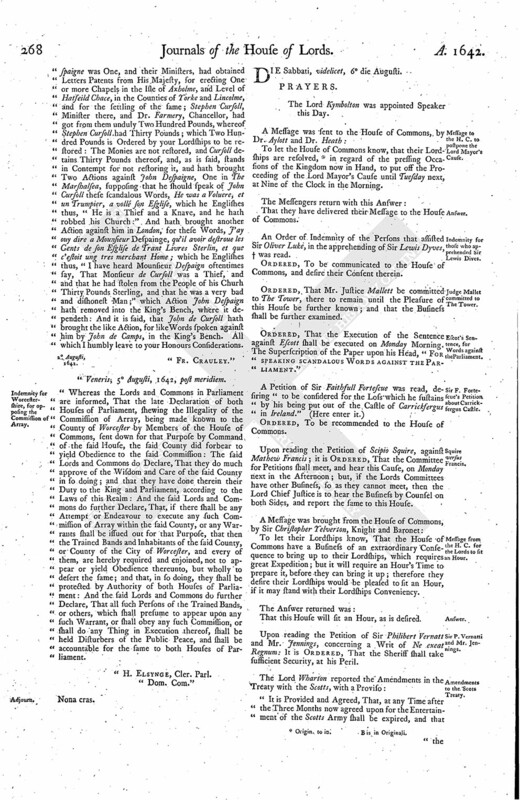 "Whereas John Galkell of Manchester, in the County of Lancester, and Thomas Hiccocke, Thomas Bennett, and Mr. Osley, in the County of Chester, and divers other Persons, are, or have been, arrested and imprisoned, and enforced to give Recognizances and Bails for their Appearances, before several Judges and Justices, which Prosecutions have been so made against them occasionally, for that they did perform, observe, and execute the Orders and Commands of the Lords and Commons in Parliament assembled, or were countenancing, aiding, or assisting unto them who did perform, observe, or execute the same, or for that they did not submit themselves to the Commission of Array, or to the Injunctions or Commands of the Commissioners therein named: And whereas divers other Persons are now, upon the like Occasions, endeavoured to be arrested and imprisoned, and enforced to give such like Bail as aforesaid; it is now Ordered, by the Lords and Commons, That the like shall not be attempted or done in Time (fn. 3) to come; and that all Judges and Justices, having Power to discharge the said Imprisonments and Bails, shall, upon Knowledge of the Premises, forthwith release, free, and discharge the said John Gaskell, Thomas Hiccocke, Tho. Bennett, and Mr. Osley, and all others whom it shall concern, from all Imprisonments, Recognizances, and Bails, occasioned by the Causes or Pretences aforesaid, or any of them, and shall suffer no further Prosecution to be had in that Behalf." And the House thought it fit that an Affidavit should be made, that the Order of this House is not performed; and then [ (fn. 4) this House] will grant an Attachment; and, because the Suits are vexatious, they shall be admitted in Forma Pauperis, in those Courts where the Causes are depending. To let them know, that this House is ready to proceed against the Lord Mayor. The Committee of the House of Commons being come, the Lord Mayor was brought to the Bar, as a Delinquent; and then his Counsel proceeded to make his Defence to the Sixth Article of the Charge; which was, That the Lord Mayor refused to (fn. 5) call a Common Council, for the storing of the Magazine, according to the Order of the Parliament." Mr. Herne said, "That whereas there is an Order mentioned in the Charge of the 24th of June, he alledged there is no such Order, and so no Contempt. The Order of the 13th of January being only to call a Common Council, &c. and no Members of the House of Commons repaired to my Lord Mayor concerning it. "That the Lord Mayor, without a Court of Aldermen, cannot call a Court of [ (fn. 6) Common Council]. "A Common Council is pro Communi Bono; every Citizen is (fn. 7) interested in it, and any Commoner may present what they will to them.
" A Grant in 15 E. III;" but, it being but in a Book, the Lords would not admit it to be read, but that the Charter should be produced. Mr. Mosse declared, upon Oath, "He hath been a Clerk since 1599; that he hath observed it to be the commons (fn. 8) Use, before a Common Council be called, the Matter is debated before, and an Order made that such a Day a Common Council shall be called." Mr. Michell said, "That a Common Council hath been Ordered by the Court of Aldermen, till of late, within a Year or Two, by Order of this House." Mr. Herne said, "The Lord Mayor heard not of the Resolution of the Houses until the 6th of July; and concluded with a Desire, That, if any Thing be new, they desire to be heard again; if not, he referred the Business to their Lordships Consideration." Ordered, That the Reply of the House of Commons shall be To-morrow, at Nine a Clock. "According to your Lordships Order of the 22d of July last, I have considered of the Matters to me referred, in the Presence of John Despaigne, none other attending me; and do find, that divers Refugees of the French and Dutch Church, whereof John De spaigne was One, and their Ministers, had obtained Letters Patents from His Majesty, for erecting One or more Chapels in the Isle of Axholme, and Level of Hatfeild Chace, in the Counties of Yorke and Lincolme, and for the settling of the same; Stephen Curfoll, Minister there, and Dr. Farmery, Chancellor, had got from them unduly Two Hundred Pounds, whereof Stephen Cursoll had Thirty Pounds; which Two Hundred Pounds is Ordered by your Lordships to be restored: The Monies are not restored, and Cursoll detains Thirty Pounds thereof, and, as is said, stands in Contempt for not restoring it, and hath brought Two Actions against John Despaigne, One in The Marshalsea, supposing that he should speak of John Cursoll these scandalous Words, He was a Voluere, et un Trumpier, a vollé son Esglise, which he Englishes thus, "He is a Thief and a Knave, and he hath robbed his Church:" And hath brought another Action against him in London, for these Words, J'ay ouy dire a Mounsieur Despainge, qu'il avoir destroue les Gents de son Esglise de Trant Livres Sterlin, et que c'estoit ung tres merchant Home; which he Englishes thus, "I have heard Mounsieur Despaign oftentimes say, That Monsieur de Cursoll was a Thief, and and that he had stolen from the People of his Church Thirty Pounds Sterling, and that he was a very bad and dishonest Man;" which Action John Despaign hath removed into the King's Bench, where it dependeth: And it is said, that John de Cursoll hath brought the like Action, for like Words spoken against him by John de Camps, in the King's Bench. All which I humbly leave to your Honours Considerations. "Veneris, 5 Augusti, 1642, post meridiem. "Whereas the Lords and Commons in Parliament are informed, That the late Declaration of both Houses of Parliament, shewing the Illegality of the Commission of Array, being made known to the County of Worcester by Members of the House of Commons, sent down for that Purpose by Command of the said House, the said County did forbear to yield Obedience to the said Commission: The said Lords and Commons do Declare, That they do much approve of the Wisdom and Care of the said County in so doing; and that they have done therein their Duty to the King and Parliament, according to the Laws of this Realm: And the said Lords and Commons do further Declare, That, if there shall be any Attempt or Endeavour to execute any such Commission of Array within the said County, or any Warrants shall be issued out for that Purpose, that then the Trained Bands and Inhabitants of the said County, or County of the City of Worcester, and every of them, are hereby required and enjoined, not to appear or yield Obedience thereunto, but wholly to desert the same; and that, in so doing, they shall be protected by Authority of both Houses of Parliament: And the said Lords and Commons do further Declare, That all such Persons of the Trained Bands, or others, which shall presume to appear upon any such Warrant, or shall obey any such Commission, or shall do any Thing in Execution thereof, shall be held Disturbers of the Public Peace, and shall be accountable for the same to both Houses of Parliament. "H. Elsynge, Cler. Parl. Dom. Com."